David Sanders joined the Rockville Brass Band in 2017. David grew up in Knoxville, TN where he began playing tuba in the 8th grade after switching from the clarinet. 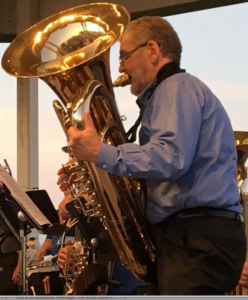 He graduated from East Tennessee State University in December 1969 with a degree in Music Education and then became the elementary band director in the Bristol Tennessee School System. In late 1970, after receiving a draft notice, he auditioned as a tuba player for the Third Army Band in Atlanta, GA. He was stationed there until fall of 1972 when he was transferred to the 81st Army Band, Ft. Sheridan, IL. After the three years of military service, he worked for a mechanical contracting company and various wholesale and retail companies while moving around the country with his wife, Marilyn, a Methodist minister and later, an interim priest in the Episcopal Church. David returned to music in 1997 after a friend asked him to join a community band in Athens, TN. Since then, he has played in community bands in Otsego, MI, Oakland, MI, Spartanburg, SC, Bend, OR, Albany, NY, Oneonta, NY, Milford, DE, Rehoboth, DE and Annapolis, MD. The Rockville Brass Band is the first brass band in which David has participated.